The HydroWorx® 3500 Series™ offers innovation and maximum versatility to your facility. This 12’x16′ therapy pool comes standard with HydroWorx’s patented underwater treadmill technology and resistance jets in one station. 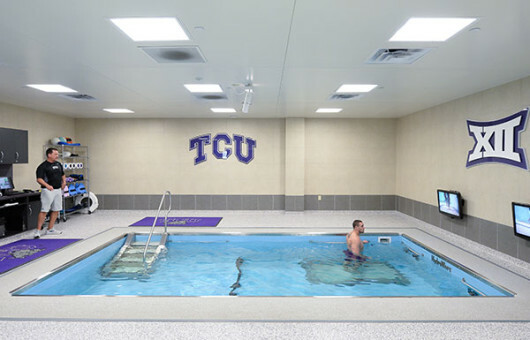 An additional underwater treadmill can be added to the pool footprint. Up to three 4-foot extensions can be added to the length of the pool to increase the size to 12’x28′. The large interior space of the 3500 Series allows greater functionality for multiple patient therapy stations or group classes. 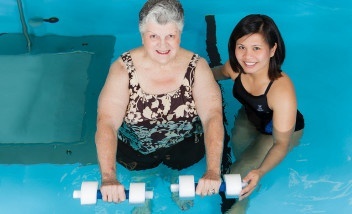 The varying depths of the pool floor also allow for natural patient progression. The large interior space allows greater functionality for multiple patient therapy stations or group classes. The recommended minimum poolroom dimensions are 20’ wide by 29’ long. This 12’ wide by up to 28’ long pool is designed to accommodate a multitude of people at once. What are the unique performance features of the HydroWorx 3500 Series pool? The variable speed underwater treadmill, which smoothly increases from 0 to 7.5 mph in safe .2 mph increments, has a cushioned low-impact design with excellent traction. Add an additional variable speed treadmill to the floor footprint. 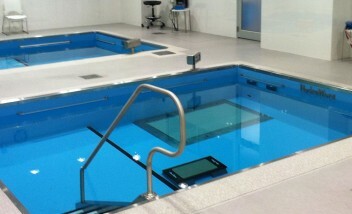 This additional underwater treadmill can be positioned at the same depth or 6″ deeper than the standard treadmill. This option also comes with resistance jets. A resistance jet is essential for competitive sports performance training, therapy protocols, swimming or deep tissue massage. The jet has nearly 200 different water speeds to choose from. Add up to 5 additional Resistance Jet stations to maximize the pool’s footprint. Customize the 3500 Series to include two underwater camera and a flat screen viewing monitor to greatly enhance a clinician’s diagnostic capabilities when evaluating a subject’s underwater gait pattern. 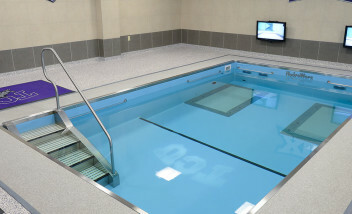 Designed to give athletes and patients extra depth for un-loading, this 7′ deep well area is a great way to accommodate deep water running or taller patients and athletes. Lightweight multi-functional and positional bars ensure patient comfort and security. A fully automated, state-of-the-art-heating unit provides variable water temperature. Electric or gas systems are available. Who are a few of your 3500 Series customers? 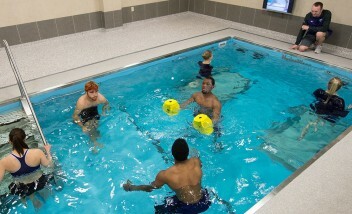 What is an example of how the college & pro sports teams utilize the HydroWorx 3500 Series pool? Multiple-athlete cardiovascular interval training is accomplished with directional resistance jets and the underwater treadmill. Athletes are placed in alignment with two resistance streams that hit the mid-point of the athlete’s chest. The floor can be positioned at various depths to create different loading effects. Sample Session: Begin the interval with the treadmill speed at 6 mph but without jet resistance. After a warm-up of 5 minutes, increase the treadmill speed to 7.5 mph or higher and activate the jets at a resistance level of the trainers choosing. This will provide a resistance that simulates an intense up-hill run and elevate the athlete’s heart rate. Stop the jet for approximately 20-30 seconds and begin again.